On a warm summer night and only a week after my second Bordeaux 2010 dinner I walked into my last wine dinner of 2013. And with high hopes we sat down to six vintages of Antinori’s Tignanello. Tig, as it is affectionately known, is one of the original Super-Tuscan. Tig is produced exclusively from the southwest-facing 47 hectare (116 acres) Tignanello vineyard. Antinori say Tig was the first Sangiovese to be aged in small oak barrels, the first Tuscan red wine in modern times to use Cabernet in the blend, and among the first red wines made in Chianti with no white grapes. The rest, as they say, is history. Originally Tig was a Chianti Classico Riserva labeled Vigneto Tignanello. First vinified as a single vineyard wine in the 1970 vintage, it contained 20% Canaiolo and 5% Trebbiano and Malvasia. Beginning with the 1971 vintage, Tignanello stopped adhering to the rules laid down by Chianti Classico Disciplinare and the wine became a Vino da Tavola della Toscana. In the 1975 vintage, white grapes were totally eliminated. Since the 1982 vintage, the blend has been 80% Sangiovese, 15% Cabernet Sauvignon and 5% Cabernet Franc. Before we got to the main show we had to negociate a glass or two of Pol Roger Brut Vintage 2002.Of all the big houses Pol is by far my favourite. 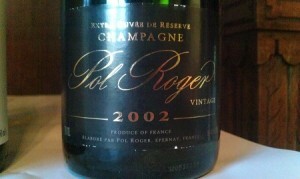 Medium weight, good intensity, nice balance of yeasty/autolytic characters and fresher floral, stone fruits and chalk. Delicious and great value. 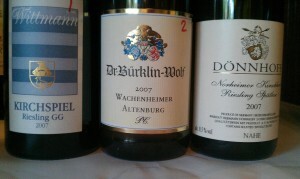 With entrees we looked at three German Rieslings from the divine 2007 vintage. I am yet to be disappointed by this vintage in Germany and more often than not blown away. The Wittmann Kirchspiel Riesling Grosses Gewaches (Great Growth) 2007 was a hint golden and showing a bit of development. Kero, oily, spice, floral, tangerines and citrus with some lanolin. The palate was floral, silky, zesty with peach and spices. There is a sweet core of fruit on a long and elegant palate. Yep, it’s a keeper. Dr Burklin Wolf Wachenheimer Altenburg 2007 a favourite producer of mine, was a lot more subtle. Holding its cards close to its chest at the moment, hints of peach and flinty/stoney notes. The palate was rich with limes, stones and chalk. Great balance and a wine that is built for the long haul. See you in 15 years Dr B! Finally Donnhoff Norheimer Kirschheck Riesling Spatlese 2007 was on display. My first thought is that this wine could easily have been picked at Auslese level and declassified. There was plenty of ripe tropical fruits, waxy notes and a hint of the marmalade botrytis characters. In the mouth it was jubey, fleshy, clean, lime jelly, stone fruits, fresh with nice sweetness. This matched particularly well with Matteo’s bugtails. Then it was Tig time. Six vintages and a whole lot of anticipation. All the bottles were from auction and previous experience has proven that old wines from auction are often only ever at 90% capacity. That being said, I’ve had some stunningly great wines from auction that were also cheap as chips. That is the gamble you take. And for this event we had two stunners, two OK wines, one a bit dried out and one that was no good. I think that strike rate is about what I would expect. Which is why I constantly talk about cellaring and why you should control the experience. Rant over, lets look at the wines. First of all I would say there is definitely a family resemblance. The savoury, bubblegum (in the good bottles), ironstone, oolong/tea leaf characters were all interwoven into the wines. In particular I thought the 2000 and 1996 stood out and looked like twins. 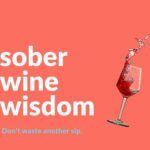 I was the only one who saw that though (that awkward moment when 11 other wine tasters are all wrong!) and a lot of people liked the 1997 which I thought was just OK.
2000 Tig was a stunner. 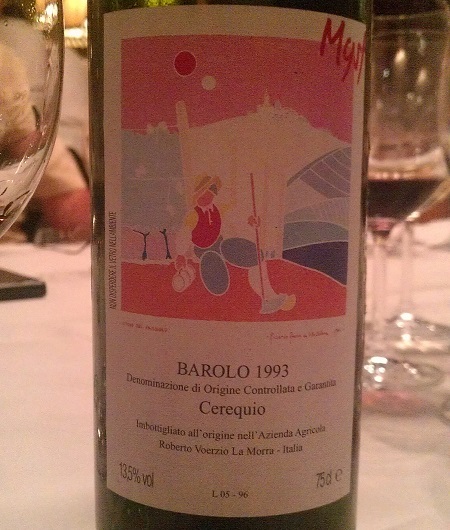 Youthful, still cherry red on the rim, smokey, bubblegum, tart, earthy, tea leaf, floral, ironstone, pepper and cinnamon. It was long, linear and floral on palate. Maybe lacking a bit of acid for what is a Sangio dominant wine but it was a cracker of a drink and we were off to a good start. 1999 was savoury, earthy, mineral, clean, cinnamon, ironstone. There was more richness and density on the palate with some tart acid and a bitter note. It looked great at first but started to dry out as the night went on. In a better cellar this may have been better than the 2000. Jumping to 1997 we got familiar characters but it was just a bit flat. I thought this was just OK. By contrast the 1996 was exciting. Flint, bubblegum, violets and roses, burger rings, iodine, tart red berries. The palate was full of blue fruits, inky/iodine notes with along and gritty tannins. This in my book was stunning. A wine that you would get out of bed for. To follow this we had the 1995 which looked like the cousin that doesn’t get to see the family enough and really only has a passing resemblance. It had similar flavours but it was just a dry red really. Again, I’d hold hope that well cellared examples of 97 and 95 would be lovely and I’ll happily help someone drink one. The last of the Tigs was from 1987. Was it oxidised? Cooked in the cellaring process? Just had a bad attitude? We’ll never know for sure but it was not much of a drink at all sadly. 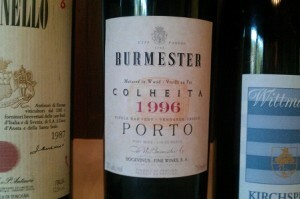 We finished with some affable Burmester Colheita 96 and it was time to wish everyone a Merry Christmas and head home. Looking back at the notes on the dinners Patrick has put on for us, we’ve drunk some amazing wines. I’m looking forward to seeing what 2014 has in store for us. As always Matteo and his team are hard to top for wine service in Melbourne. Actually that could extend to service in general. Thanks to the team for your hospitality and never complaining about having 100 or so glasses on the table at the same time. Did I mention the beautiful food and they allow BYO? You just have to go!